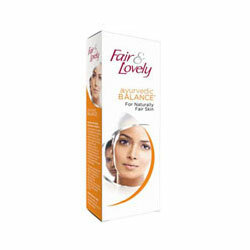 Fair & Lovely Ayurvedic Balance for Naturally Fair Skin. Natural fairness, Balanced skin tone, Rejuvenated skin. Fair & Lovely - Worldwide Shipping. Natural fairness, Balanced skin tone, Rejuvenated skin. According to ayurveda, your skin appears naturally fairer when in a state of balance. Presenting New Fair & lovely Ayurvedic Balance enriched with Lodhra and Manjistha in addition to kumkumadi Tailam, a powerful concoction of 16 precious ayurvedic ingredients, known to help restore the natural balance on skin. Natural fairness in 4 weeks with regular continued usage. As per Ayurvedic principles, the human body is made up of "Panch Tatwas", the 5 elements of nature - Earth, Fire, Air, Water and Space . A balance of these items is the key to naturally fairer skin. Sun, pollution and stress are among factors that cause an imbalance on skin making it appear dull, dark and discolored. This cream is enriched with lodhra and manjistha, in addition to kumkumadi Tailam, a fairness concoction of 16 ingredients, known to help restore the natural balance on skin to give natural fairness. Use twice daily on cleansed face and neck for best results.